Industrial and rustic design come together on the Mill Valley with details including vintage style rivets securing the blades, coin-edge thumb screws and a barn style open hood light. Style meets performance with the Mill Valleys white hood reflector that maximizes light from a vintage style LED Edison bulb. Damp rated and offered in a slate finish, the Mill Valley completes the look of casual farmhouse living spaces or patios. The flushed mount makes this fan ideal for spaces with lower ceilings. 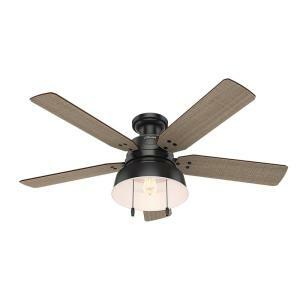 Tbook.com crawls the web to find the best prices and availability on Hunter Fanss and related Tools and Hardware products like Hunter Mill Valley 52 inch LED Indoor/Outdoor Low Profile Matte Black Ceiling Fan with light. For this page, related items include products we find that match the following keywords: "Hunter Fan" at our vendor partner Home Depot. Hunter Mill Valley 52 inch LED Indoor/Outdoor Low Profile Matte Black Ceiling Fan with light is one of 151 Hunter Fanss and related products listed in the Tools and Hardware section of Tbook.com If you have any questions on this product, please give us a call at 734-971-1210 during the hours of 9am - 5pm EST for assistance. Thank you for shopping at Tbook.com, the Internet Department Store!